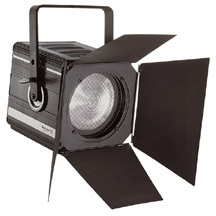 The Fresnel fixture is designed to create a relatively even field of light with adjustable intensity and field size. It is most commonly used in film and television productions. The name comes from its Fresnel lens, which bends the diverging rays of light emitted by the bulb into a controlled beam of light. This lens has the same light-bending characteristics as a standard Plano-Convex lens but the convex curve is compressed into jagged steps, making it lighter and thinner so that it retains less heat.